CAPUCHIN Father John Spiteri has kind words for the members Wynnum’s Guardian Angels Parish, as he departs after six years to take up a new mission in Melbourne. “This is a warm hearted parish, generous to a fault, and they’ve been very patient with me. They’ve put up with my antics,” he said. 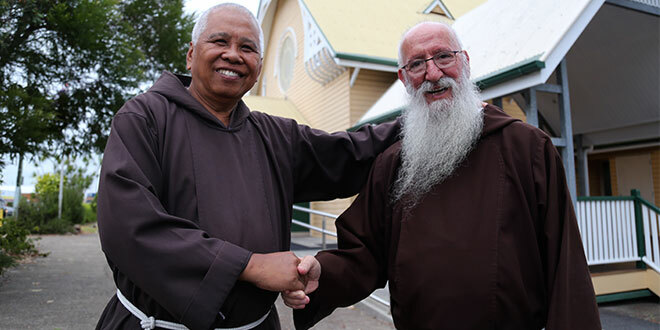 The Capuchin Friars have been entrusted with leading pastoral life in Wynnum since 1945, and their pastoral work extends to the Apostleship of the Sea at the Port of Brisbane. Fr Spiteri, 70, has been busy welcoming new parish priest, Fr Severino Bustamante, who has spent three years as chaplain to the Italian community in Newton, Adelaide. “I am really looking forward to working with people here. I sense they really love Fr John and have a very healthy relationship with one another, amongst many organised groups,” Fr Bustamante said. Fr Bustamante, entered religious life 36 years ago in the Philippines and was sent to Australia in 2005. He said following the revelations of the Royal Commission, the Church had a healing role to perform. “This is the home of wounded hearts and wounded people,” he said. Fr Spiteri said he was looking forward to the challenge of moving to South Melbourne, where the Capuchin Friars have taken over the running of Sts Peter and Paul’s parish, formerly the domain of high-profile community worker and media personality “Fr Bob” Maguire. “The parish has a huge outreach program. It means I will be taking on a completely new role,” he said. Drawing on his six years experience at Guardian Angels, Fr Spiteri said he believed the Church could seek more input from lay people in parish life. “We should concentrate on working with the laity, getting a good group of people, looking at their gifts – how can they make our parish grow,” Fr Spiteri said.